Bugga.NET » Blog Archive » Homebrew April/May 2014 – Stout w/ grain. This morning I bottled my stout, made from an ESB 3kg “extra special stout” kit and 200gm of chocolate malt grain. It’s been in the fermenter for 16 days and spent the last 5 days at a specific gravity of 1.018 I am a little concerned by the last as I was expecting ~1.012-1.014 range, so I reduced the amount of sugar at bottling time hoping that all will be well. Tasting the beer that was used to measure the SG, indicated that all was reasonably well with things. There is no initial SG reading as I have previously not bothered with such things, but as I was concerned that the ferment may be on the stuck side, I decided I better start recording these things. 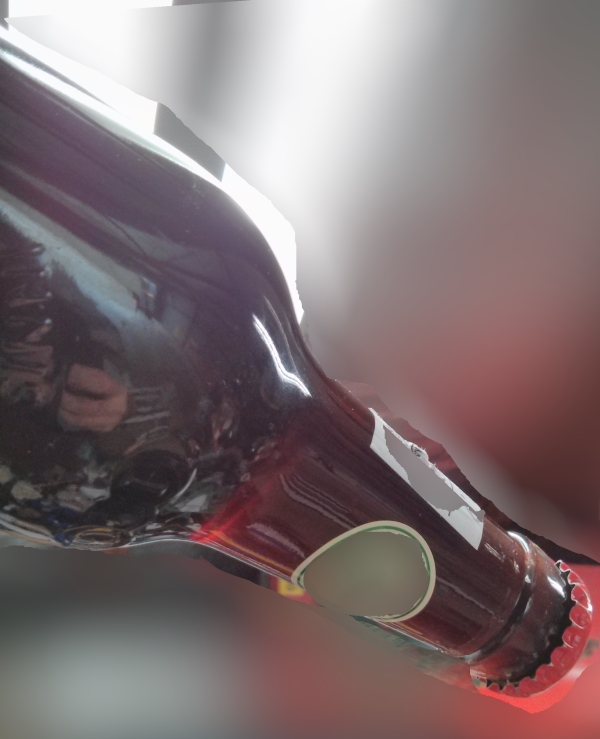 I have included a photo of the stout in a clear bottle (the bulk of it is in green 680mL glass bottles or brown 750mL glass bottles), but I like to have a little to snoop on as things progress. I like the colour and look forward to tasting this in a few weeks. Out of this bottling I ended up with 12x 680mL bottles, 12x 750mL bottles and 1x 330mL bottle. Turns out that this is actually rather tasty. So much so that I had to lay down another.